Starting from scratch with Trachycarpus fortunei. 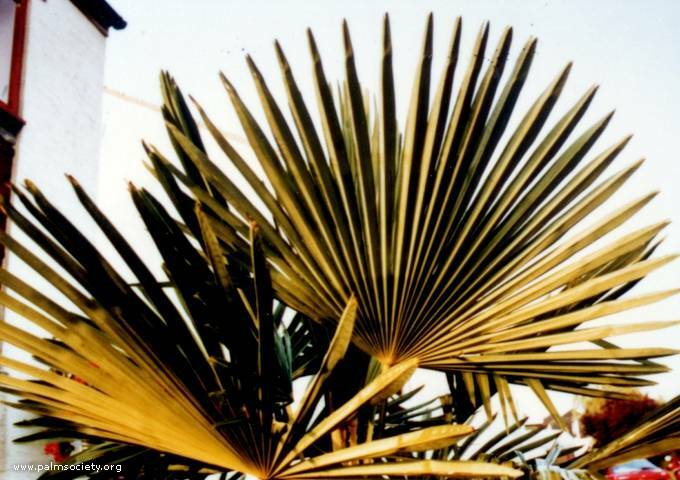 I would like to share my experiences of growing Trachycarpus fortunei (the Chusan Palm), and I hope that this 'back to basics' article may be of some interest to fellow society members. My front garden faces directly southeast. I started by digging a large hole in the middle of my front lawn, some 1m 50 deep. This attracted the curious attention of my neighbours who often inquired what was to be planted there. Such was the amusement that I woke one morning to find a gnome sitting on the side of the hole brandishing a fishing rod! Over a period of weeks I collected soil from molehills in the local fields and plenty of well-rotted cow manure, which I stored in sacks. I also bought plenty of sharp sand and moss peat. And in May 1989 I purchased a 5-foot Trachycarpus and a 2-foot Chamaerops. Before planting the Trachycarpus I lined the bottom of the hole with some gravel because the subsoil had a clay consistency and I have heard that Trachy's don't like waterlogged soil. This should assist with the drainage. I mixed up in equal parts the soil, cow manure, sharp sand and moss peat and proceeded to fill the hole. A friend helped me lower the palm into it and some more soil mixture was put on top. I watered it well for about a fortnight. I feed the palm regularly during the growing season by filling a stocking full of manure and soaking it in a large bucket. I then add some of this liquor to my watering can. The palm has been exposed to low temperatures and high winds. The lowest temperature was -8°C in February 1991 when I taped a large piece of polythene around it as a precaution. In its first winter the palm was badly wind damaged especially after the major storms we experienced. I have overcome this problem by binding the fronds together with some parcel tape, during the winter months. I bind the inner fronds together first, a few at a time, followed by the others, proceeding in layers. I think it's worth going to this trouble to keep the leaves in prime condition. Coupled with good preparation, two good summers and lavish care the palm really has grown quite rapidly approximately 75cm in two years. I planted the smaller Chamaerops about the same time. This has also responded well. In three years my Cordyline australis must have almost doubled in size, given the same care. It now stands approximately 2.5m in height and the trunk is now dividing after flowering for the first time. I also have a potted specimen of Trachycarpus 'wagnerianus' approximately 60cm. I would be interested to know when this variety was introduced to Great Britain and if there are any larger specimens in the country, as the only ones I have seen are at Kew, and they're quite small. My success with the Trachy seems to prove how important good preparation is, and that it's worth going to the extra trouble to get your palm off to a good start.